The Network agreed to accept the word of Mr Krisada Boonraj that an independent committee would be set up immediately to review within 60 days the decision of the Hazardous Substances Committee [that allowed the registration of paraquat and chlorpyrifos for application in Thailand] on condition that the representatives appointed by the government to the committee should be indisputably free from conflicts of interest. In addition, the committee should abide by the principle that impacts on public health should be the central consideration in the decision whether or not to ban these highly toxic chemicals, as stated by the Minister of Agriculture and Cooperatives himself in front of the gathered protesters. However, the Network does not agree that the Ministry of Agriculture and Cooperatives should be the government’s focal point on this issue, as it does not have expertise on public health. In fact, it has a conflicted role in that its main duty is to promote and ensure the effectiveness of pesticide use. The Committee on Hazardous Substances must review its decision and consider banning paraquat and chlorpyrifos by December 2019, in line with the timeframe put forward by the Ministry of Public Health. The process should involve consideration of the data, and their decision should be taken without the involvement of people that have a private economic stake in the chemical products, as prescribed in the Hazardous Substances Act of 1992 section 12 para 2. The decision should be taken on the basis of up-to-date, impartial information put forward by departments who have direct expertise on the subject, including the deliberations of the Ministry of Public Health, the Commission on Public Health, the National Legislative Council and the information developed by academics working on this topic, which would be sufficient basis on which to consider banning the use of paraquat and chlorpyrifos. The Ministry of Agriculture and Cooperatives should carry out a study of alternative methods, as proposed by the National Agriculture Council, for the protection of health of farmers and consumers. 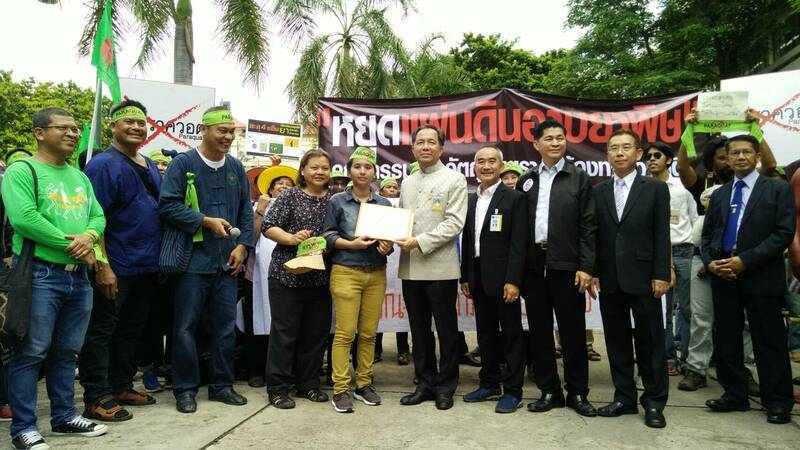 A study by the Thai Pesticide Alert Network (Thai PAN) found that of the farmers who grow major economic crops in Thailand such as rice, sugar cane, corn, oil palm, rubber and cassava, 63 percent do not use paraquat to combat weeds. This indicates that there are certainly other herbicides and methods for managing weeds which are more effective than Paraquat, but the relevant units do not collect knowledge on this for wider distribution. If, in the transition period prior to the proposed ban on paraquat and chlorpyrifos in 2019, it is found that the ban will pose a cost to farmers, it is proposed that the Ministry of Finance carries out a study and prepares to collect a tax from the sale of highly dangerous pesticides. The resulting tax revenue should be put to the mitigation of impacts and support farmers to adjust towards more environmentally friendly methods of managing weeds, which will help reduce the effect on farmers who have to stop using the highly dangerous chemicals or face exclusion from markets due to unsafe toxic residues. This measure will help to improve competitiveness of Thailand’s agricultural produce in the global markets in the long term. In our next Assembly of the representatives of all 700 organisations in our Network, to be held in 3 weeks time, we will make a further statement about the next steps in our collective campaign. For public release and distribution.